I just got a new project which is using Estimote. I cannot write about the purpose of this app but I will write about what it is and example to use it. 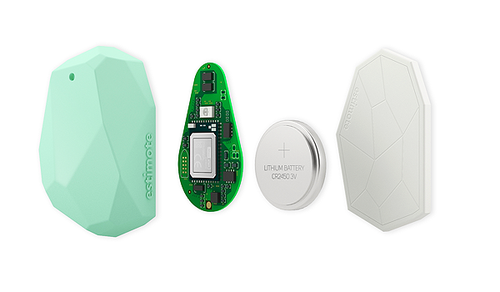 What is Estimote Beacon ? So basically it is a small device that broadcasts a radio signal. But what is that signal and how does it work? Estimote Beacon broadcasts signal using Bluetooth LE and iBeacon standard which is implement using Bluetooth’s Proximity sensing specification. You can think of it as a someone who keeps shouting “Hey, I am here. My name is …“ every second. Proximity UDID : Unique identifier of the beacon. As default, the value will be the same for all devices that comes from Estimotes but you can change it later. Major : Most significant value of beacon. You can use it as group number. Minor : Least significant value of beacon. You can use it as member number in group. The main concept of this app is to notify the user when the phone is close to any of Estimote devices and the notification must include the information that can indicate which device user is close to. For example, if the phone is close to area A, the phone will get the notification like “You just got into area A, Do you want to make a landmark ?”. We need to install Estimote SDK to our project. You can see the instruction from here. After you have created project and setup, the first thing you need to do if you are going to support iOS8 is request permission to use location service due to policy changed. Add the following code to anywhere depends on when you want user to see alert dialog but need to call it before using any estimote function. The reason why I used responseToSelector function is because requestAlwaysAuthorization is not available prior to iOS8. We need to check it first before calling it. Then you have to add key NSLocationAlwaysUsageDescription in the info.plist file with the text value which user will see when alert dialog pop up. Do not forget to create locationManager as a instance property otherwise, the alert box will disappear before you can take any action, because the locationManager object get released at the end of the function. Next we are going to create Area class to hold our beacon informations. id : The ID of the area, we will use it for reference later. name : Name of Area. estimoteMajor and estimoteMinor : The values that can indicate which device associate with this area. Next step is to create list of areas in viewDidLoad of the root ViewController. For example, we have 3 areas to notify. We will use class ESTBeaconManager to manage all of our Estimote Beacon tasks and use class ESTBeaconRegion to define which region we want to monitor. Put the following code in viewDidLoad. ESTIMOTE_PROXIMITY_UUID is a fixed UDID for all Estimote Beacon device. If you happen to change it, you have to change this value to match with yours. Method startMonitoringForRegion: is working even the app is in background state but not when you kill the app. Now we will get notification when the phone is close to one of those 3 areas and also when exit the area (please note that the exit delegate will get called after 30 second). But wait, How can we know that we got into which area, A, B or C. The solution is we have to use another method that is startRangingBeaconsInRegion: but we will get new problem, this method does not support in background mode. The solution is we will use startMonitoringForRegion: first and after beaconManager:didEnterRegion: get called, we have 5 seconds that iOS allow the app to execute code in background. With that 5 seconds we will use startRangingBeaconsInRegion: to get which beacon device we are close to. Now when the app is in the background or the phone is locked, we will get notification with the area name. With Estimote Device and iBeacon, we can use it to empower ideas based on indoor location or proximity such as Retail Shop that will notify user about the promotion when you are close to the product or Check-in app.